There’s more than a nip in the air these days. The wind is whipping, and the temperatures are low. It’s challenging to keep yourself cozy, let alone know how much bundling a baby needs. Our first instinct would be to wrap their little bodies in as much warmth as possible. But too much heat can do more harm than help. On the flip side, babies do get colder than we do – faster. “Babies do lose heat faster than adults, because of the increased surface area of their skin,” said Teresa Recker Gross, DO, of OhioHealth Pediatric Physicians. 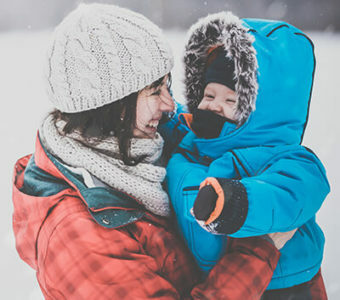 Dr. Recker Gross recommends bundling baby in just one layer warmer than what you would need, and if you’re worried baby is too hot, you can always check by feeling their hands and feet. Signs of overheating include sweating or baby’s chest feeling hot to the touch. When you’re running around town, opt for a baby carrier/car seat cover instead of a puffy coat for infants. A jacket will impact the safety of the car seat, causing the harness not to fit snugly against baby’s body. You can find warm car seat covers that zip up and protect baby from the elements without impacting the safety of your child carrier. Dr. Recker Gross says they’re also an excellent way to protect your baby from germs when you’re running around town. When you’re at home, swaddling can do double duty, by keeping baby cozy and have a calming effect on a fussy infant. It’s also an old myth that babies need to be extra warm at night. In fact, keeping their room cooler, yet comfortable, may help protect against Sudden Infant Death Syndrome (SIDS). 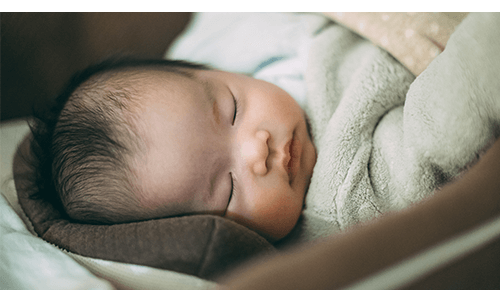 To learn more about SIDS, you can read the Updated 2016 Recommendations for a Safe Infant Sleeping Environment from The American Academy of Pediatrics.